In the rich tradition of shabby-chic garage bands from London comes four-piece, Palma Violets. Purportedly inspired by, among others, the Libertines, it's easy to see how Sam Fryers, Chilli Jesson, Pete Mayhew and Will Doyle have been influenced by Pete and Carl and the anthems of Albion. They're even signed to Rough Trade. 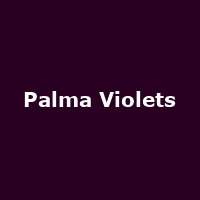 Arguably, Palma Violets are not going to launch indie guitar music into new and exciting dimensions but it is just as easy to counter that they are already generating sufficient excitement for that not to matter one jot. The ramshackle garage guitar band will always be a welcome addition to the live schedules - after all, the post-Libertines era hasn't held back the Vaccines and they sound like Embrace demos. No, the Palma Violets may not be anything new but they do offer the raw crackling sweaty excitement of four musicians playing for their lives with memorable hooks a plenty. Sometimes you just want vanilla. The October tour kicks off in Nottingham on the 1st, followed by shows in Edinburgh, Newcastle, Middlesbrough, Wrexham, Birmingham, Leicester, Oxford, Bedford (sold out), Brighton, before the final date announced so far in Southampton on 30th October 2012. We have tickets available now, priced from as little as £6.50. After a busy summer playing festivals and touring with Savages, Palma Violets have more juicy dates coming up. The quartet will be playing with Alabama Shakes in Oxford and Brighton (4th and 5th September) and, this Friday and Saturday, playing the Reading and Leeds festivals. It's all go.